Showcase your medical specialties and promote a comprehensive approach to the diagnosis, treatment and prevention of specific conditions and clinical areas. 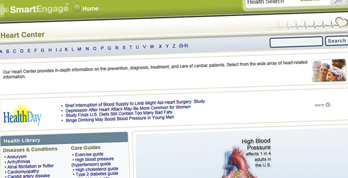 Health Centers include health information, illustrations, tools, videos, and news related to a key service line all in one centralized location. There are also two designated areas in each center's homepage for your customized information, such as: a welcome message, call-to-action, and links to other areas of your website. Our solutions also include comprehensive patient education materials, health news, complementary and alternative medicine information, drug databases, health risk assessments and wellness tools. Our A.D.A.M. OnDemand Catalog is Growing! A.D.A.M. OnDemand is the most comprehensive library of off-the-shelf medical eLearning programs for patients, students, health care professionals and the pharmaceutical industry. Our In Depth Reports are designed for health information seekers looking for more comprehensive and detailed information about common chronic diseases and wellness issues like cholesterol, lung cancer, heart disease and smoking. Adamimages.com is one of the world’s largest libraries of medical illustrations with nearly 30,000 detailed and medically accurate images ready for immediate download. A.D.A.M. (a division of Ebix), the company that pioneered online health content, is dedicated to creating and offering the most effective and innovative educational solutions possible for teaching medical science and improving health literacy. EBIX, a leading international supplier of On-Demand software and E-commerce services to the insurance industry, Ebix, Inc., (NASDAQ: EBIX) provides end-to-end solutions ranging from infrastructure exchanges, carrier systems, agency systems and risk compliance solutions to custom software development for all entities involved in the insurance industry. © 2018 Ebix Inc. All rights reserved.